The Orchid Column: How do I cut my orchid spike after flowering? How do I cut my orchid spike after flowering? How do I cut my orchid after it flowers? is one of the most-asked questions that we receive at the Fuqua Orchid Center. This is a terrific question. It's smart to ask before cutting. It is possible to destroy your plant by hacking off the wrong parts. Where to cut depends on what type of orchid you have. You also need to know the difference between the spike and the stem of an orchid. The next four posts will show you where to cut the spike on four popular types: Oncidium, Phalaenopsis, Cattleya and Dendrobium. First, let's talk about cutting tools. Your household scissors are not a great choice even if they are brand new and sharp. Scissors will crush a flower spike leaving behind damaged tissue. You may already own a pair of hand pruners. Pruners are probably fine for deadheading your orchids if you own just a couple of young orchids. 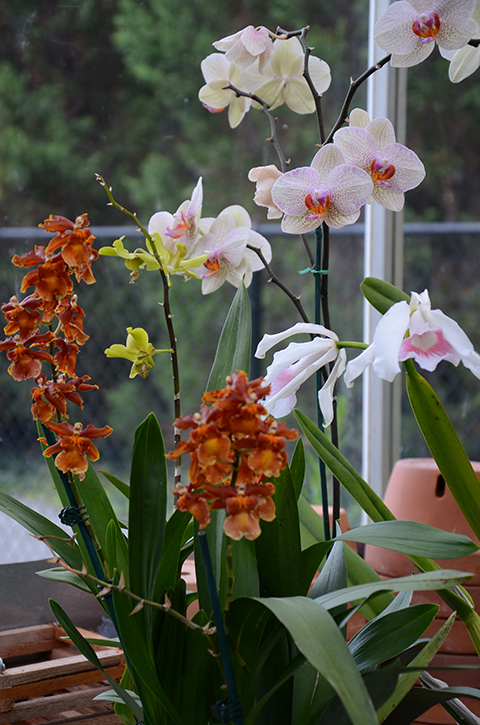 However, if you have more than four or five orchids, or orchids that are hand-me-downs it's wise to think about your cutting tools and your pruning practices more carefully. Consider the blade on your hand pruners. Unless they are brand new they are probably not clean. Do you remember which plant you pruned last? It's sap remains on your blade along with countless bacteria and fungi. There are many plant-specific viruses, bacteria and fungi that infect and weaken orchids. Many of these die over time after exposure to light or cleansers. But some viruses can remain alive in the environment for months. Viruses are carried from plant to plant on cutting tools and by certain common insects like aphids and thrips. How likely is it that your plant has a virus that could infect your other plants? If you have just two plants, or plants that are recently out of the laboratory, the likelihood is pretty small. But if you have many plants, some of which are decades old, the chances are much higher. Unfortunately you can't be certain without a virus test. Anyone who has a sizable collection should practice clean cutting technique. In case your're wondering...we like razor blades for deadheading and for pruning orchids because they are dependably sharp and ultra-clean, if not sterile. Our collection is large; many of our plants are irreplaceable and some are more than 20 years old. Thus our iron clad rule: One razor blade per plant. I buy them in packs of 100 in the paint department at Home Depot. 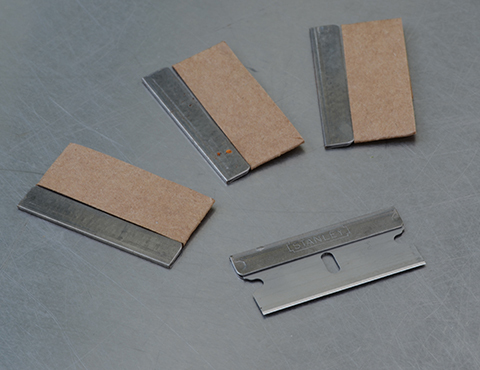 Razor blades must be stored and disposed of responsibly. We keep open packs in small tupperware containers that have a tight-fitting lid. Used blades are kept in a similar container that is sealed and mummified with duct tape when full. 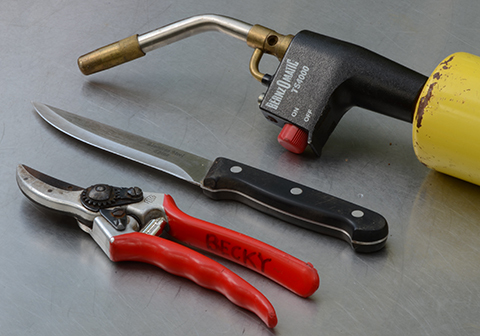 My second choice is a pair of pruners that I flame with a propane torch for 30 seconds between plants. Flaming my pruners dulls the blade and I can never be entirely sure that every microscopic virus particle has been incinerated, so I'm never really happy using this method. What about using bleach to sterilize pruners? Bleach, even at a 100% concentration, won't kill all viruses, and it is highly corrosive to steel and aluminum. Even though gardening tools make great gifts, I realize that not every serious orchid hobbyist wants to find a propane tank under the Christmas tree or a 100-pack of razor blades for their birthday. If you are using unsterilized pruners at least srcub them thoroughly with a toothbrush, dry them, open them up and then solarize them outside in full sun for a few days. Where to cut an Oncidium spike. Where to cut a Phalaenopsis spike. Where to cut a Cattleya spike. Where to cut a Dendrobium spike. Excellent post. Great information. Thanks! This tool for orchid cutting can be bought as well as water jet cutting in Perth equipment shop. This is where we buy DIY tools we need. This doesn't tell me where to cut it, only with what tool and tool preparation. It does tell you where to cut if you click on to "where to cut an oncidium"or "where to cut a phalaenopsis",at the bottom of the page. We focus on data recovery – whether it is photos of your grandchildren or your company’s QuickBooks data – we know it is important: managed IT services We also believe in saving you money, so we offer good values on both new and used (refurbished) computers. Stop by and see what we have in stock, it is constantly changing but you can always find some ThinkPad's in stock. You'll need to be able to decide no matter if you desire to plant annuals or even perennials Using your garden, or even a good mix of both. Annuals, such as snapdragons, zinnias, along with flowers grow, bloom, AS WELL AS die off inside single growing season. Perennials towards additional hand can grow AND bloom, year soon after year. must view it to know more.